Last Friday the US Technology Index fell almost 3%, with selling concentrated in the largest stocks: Facebook, Amazon, Netflix and Google (the so-called 'FANGs') plus Microsoft and Apple were all down 3-5%. The slide resumed on Wednesday and Thursday and investors must question whether this will continue. I think there are 3 things to understand before you make a decision. The first thing to understand is that many have the cause wrong. The media credited the sell-off to a timely Goldmans note published Friday, or to some other news published around this time. But in my view the technology sell off was caused by a rally in Bank shares, not a tech sell-off in isolation. From Wednesday to Friday last week Banks rallied sharply, trading up 5% against a flat market. This 3-day move ahead of the market was a 3 standard deviation event, something that should only happen once every year or two. Whilst the Bank index was rallying on Wednesday and Thursday the Technology sector was up about 0.3% on both days - its dramatic fall only started on Friday. So Banks rallied first, then Tech fell 2 days later when investors and trading algorithms started reacting to this move and rebalancing positions. This relationship between Financials rallying and Technology falling shouldn't come as a surprise as this is exactly what happened last November when Trump was elected and bond yields rallied, making banks relatively more attractive. Technology, as the other large sector with some of the most liquid companies was a source of funding. The second thing to understand is investor positioning. Technology has had a dream run over the last year, up 34% in the 12 months to last Friday and beating the index by 17%. Apple, Alphabet (Google), Amazon, Facebook and Microsoft accounted for almost 40% of the performance of the S&P 500 index year to date. If you were underweight Technology, and in particular these mega-capitalisation FANG stocks, you probably underperformed the index. Banks, the winning sector in Q4 2016, has underperformed the market by 6% since the start of the year. As a result investor positioning in Technology shares is at extreme levels with investors crowding into these winners. The sell-off on Friday was concentrated around the best performing, highly liquid mega-cap stocks as they were the easiest stocks to sell quickly. It is interesting that the selling on Wednesday and Thursday was more broadly based across the whole sector. Within equities Technology has become a proxy for growth and Financials a proxy for value. Since the start of the year there has been a rotation into relatively cautious trades of secular growth and defensive quality, at the expense of value. Cautious macro trends and inflation data have resulted in lower bond yields, boosting growth stocks and weakening value stocks. A reversal of this trend - positive macro trends and strengthening yields - would conversely be bad for Technology. This relationship goes against the more traditional view that Technology is cyclical so a strengthening economy is good and a weakening economy bad for the sector. The third thing to understand is that this sell-off has nothing to do with earnings. This is probably obvious from the first two points, but worth being clear that nothing fundamentally changed on Friday. Technology has led the market with strong earnings upgrades over the last few quarters. I see no reason to expect that there won't be another strong earnings season from technology this quarter. The sector is, however, more expensive than it was at the start of the year as investors have chased growth over value. Investor expectations are elevated and the hurdle for a good earnings season in Technology is higher than we have seen for a long time. But on the other hand Technology has strong fundamental earnings momentum. Take semiconductors, the best performing sub-sector within Tech. Gross revenue this year is on track to reach $400 billion, up 18% over 2016, and is forecast to grow rapidly in 2018 as well. To put this in perspective semiconductor revenue fell 0.2% in 2015 and was up only 1% in 2016. There is a lot of hype around Artificial Intelligence, Augmented and Virtual Reality, Self-Driving Cars, drones and other gadgets, as well as a new iPhone 'super-cycle' - but this is more than just hype and is translating into real demand growth. 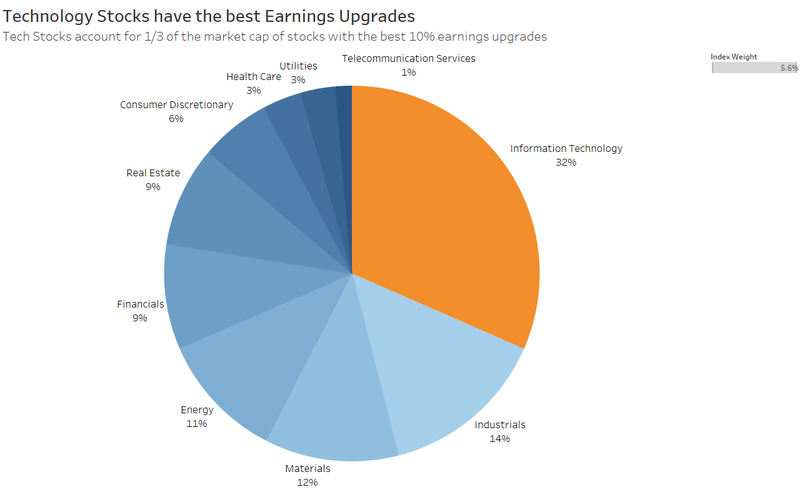 The chart below shows how Technology stocks dominate the basket of stocks with the best earnings upgrades. Since August last year the Technology sector has consistently had the best momentum. 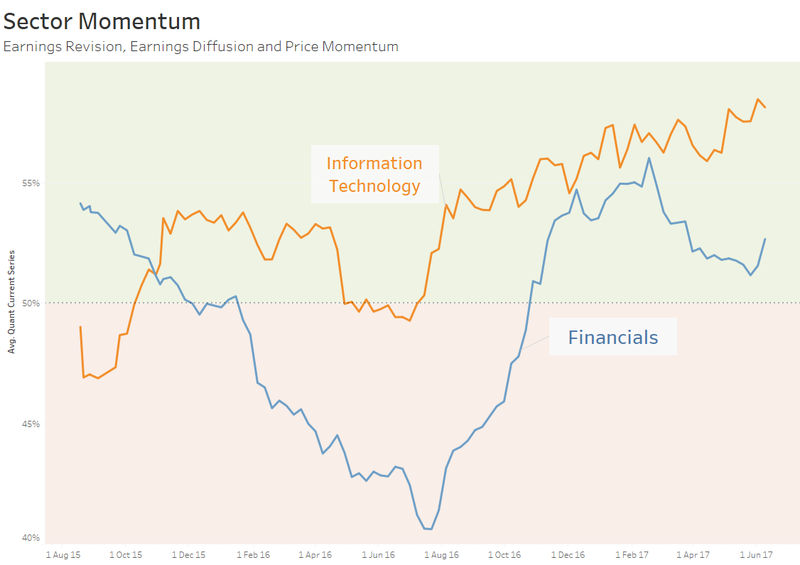 Below is a chart comparing the Technology and Financial sectors, showing what we at Alphinity call momentum - a combination of earnings revisions, earnings diffusion and price momentum. It is expressed relative to the rest of the market, with a score of 50% is equal to the market and above 50% better than the market. Momentum in the Technology sector has continued to strengthen relative to all other sectors through the first half of 2017, and has not shown any weakness recently. The Financial sector rallied off very low levels in August, peaked in February and until the last few weeks had been declining. The uptick in the last two weeks is notable and worth monitoring if it will continue. One reason for the sell-off to continue is to fund a rotation to another sector, such as Banks. Banks are seeing investor support with the hope for capital returns after the annual US bank stress tests due on 26 June as well as the prospect of deregulation under the new administration. But on the other hand some of the recent economic data has been weaker than expected, moderating the prospects for rate rises. There are positive signs for Banks but the inertia for the sector to lead the market is not as well established as it was in Q4 last year. Another possibility for the sell-off to continue is that the recently price action creates panic in technology shares, and given investor crowding this could end badly. But investors are also afraid of missing out if technology continues to rally. Reporting season starts again next week with Adobe, Oracle, Red Hat and other software companies. How brave are you feeling that Tech doesn't have another blow-out quarter? If the sell-off continues, how bad could it be? The S&P 500 Info Tech sector has fallen 4% vs the market since last Friday. That is almost as severe as the sell-off between 8 and 14 November 2016 around the US election where Tech lost 4.2% relative to the market, or the momentum rotation earlier in the year where it lost 5.8%. But despite a 4% fall the sell-off so far is mild in the context of Technology's relative performance. The sector is still up 32% over the past year, 15% ahead of the market. Depending on your perspective this is either good news that this is already about as bad as we have seen recently, or that it could fall a lot further to mean-revert to the market performance. The direction of the sector will unfold as investors nervously watch the share prices and as earnings season kicks off next week. Is this a turning point, or a bump on the path to even higher returns in the sector? At Alphinity we emphasise individual stock selection rather than trying to time individual sectors, but we are watching with more than a bit of interest how this unfolds.